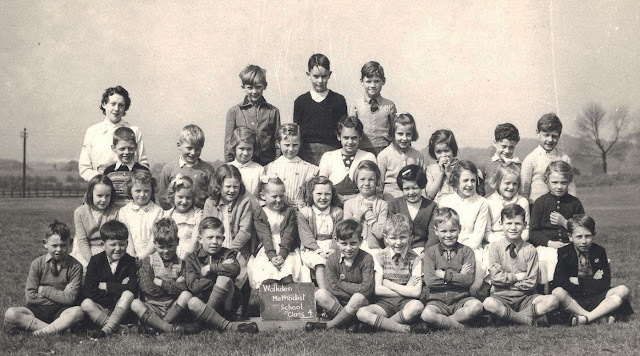 and next door neighbour, Susan Grimshaw (second row, third from right). 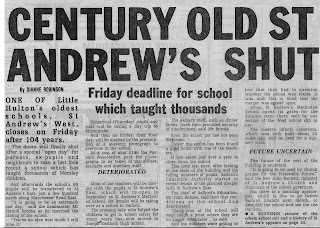 I went to school at St. Andrews from 1954-1959, and remember being terrified (with no particular reason) of the headmaster, Mr. Ramshaw, of whom I know nothing. 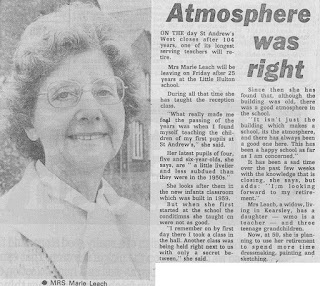 My father was aware of this, and on school mornings, when I was dawdling and reluctant, he would shout, "fifteen minutes to Ramshaw-time" as a way of reminding me that if I was late, I might end up in the headmaster's office. I remember an assembly room, where we met each morning to say prayers. It was, after all, a Methodist school, and was reasonably strict, with corporal punishment doled out infrequently to the worst offenders. 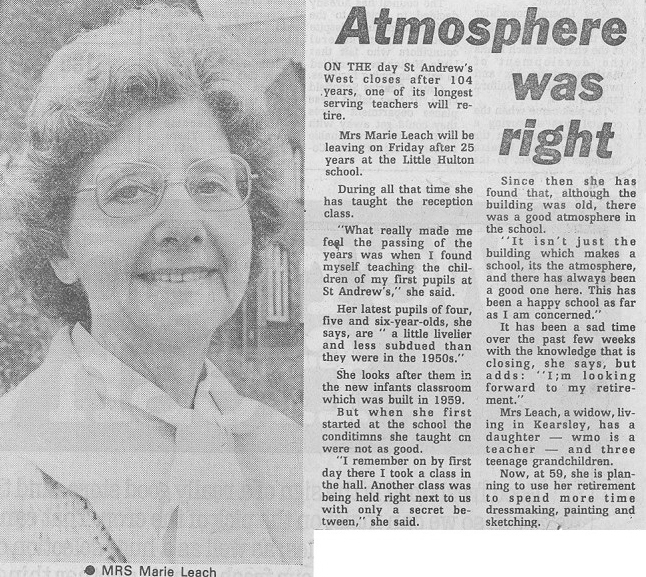 My favourite teacher was Miss M. Berry, who lived in Farnworth. 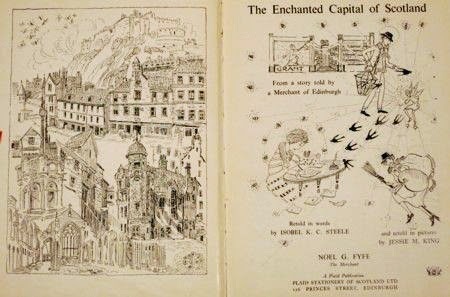 When I left the school, she generously gave me a copy of The Enchanted Capital of Scotland and other books as a parting gift. They meant a lot, and I still have them. My desk was ink-stained, and everyone sat in rows facing forward There was a huge circular metal pipe running along the wall, just above the skirting board, which provided some modicum of heating. Although my classroom was co-ed, the school had separate playgrounds for boys and girls, There was also a grass playing field behind the school. 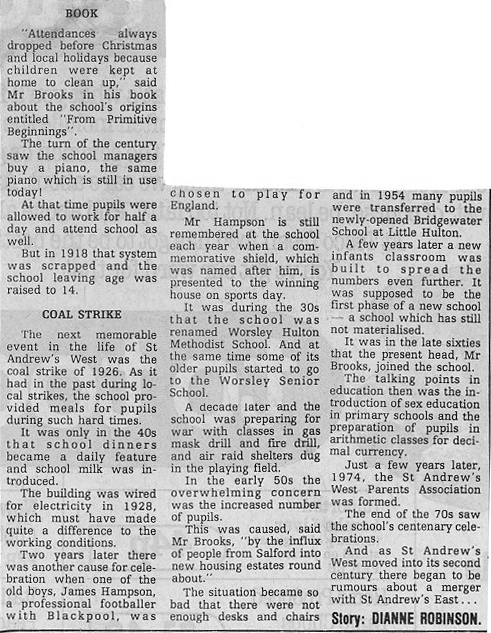 Balls, rubber quoits, skipping ropes and wooden hoops were provided at playtime. I remember a cloak room, replete with clothes hooks, on which we hung our coats and scarves. Over each peg was a picture, so we could more easily remember the peg on which we had left our clothing. 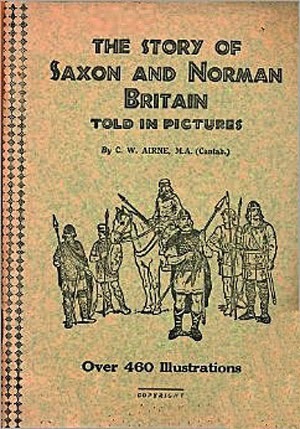 When I was eight or nine years old, we were given a series of history lessons that began with prehistoric Swiss Lake Dwellers and ended with the Saxon and Norman invasions of Britain. 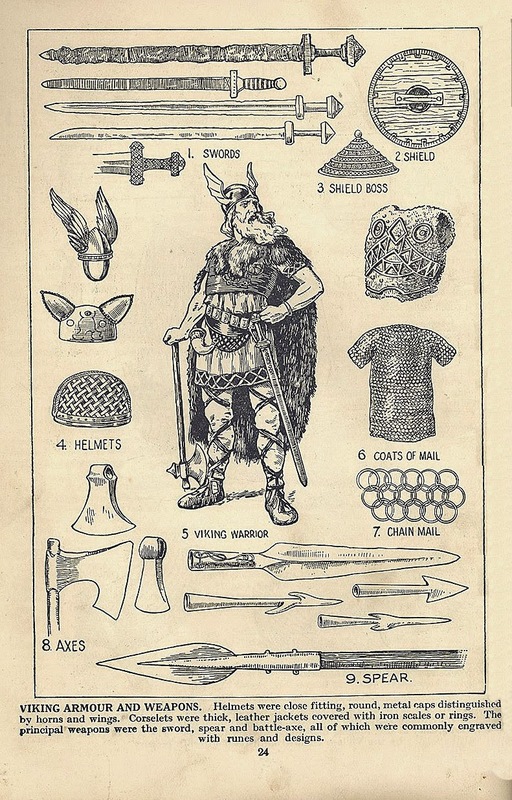 It instilled in me a life-long passion for things ancient, which ultimately led to a D.Phil in European Prehistory at the University of Oxford. I also recall being taught how to weave on a small cardboard loom and how to knit. It was a time when it was safe to walk to school unaccompanied by an adult. 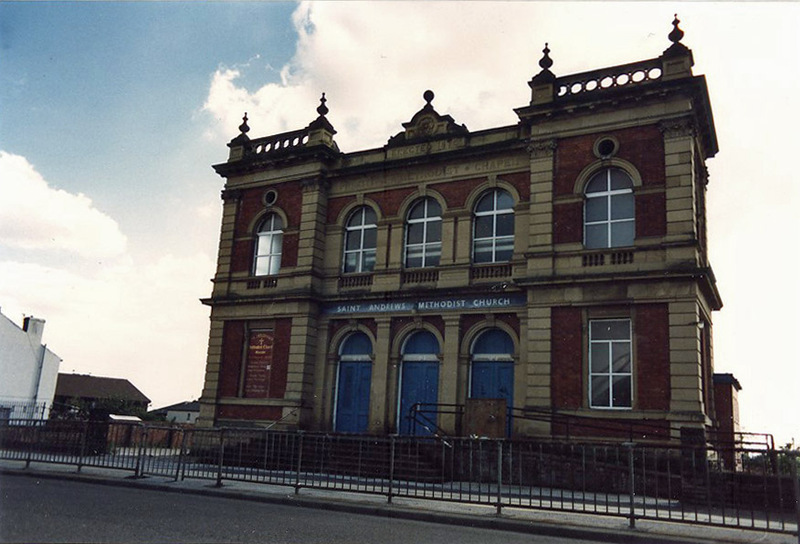 I lived on Ordsall Avenue, which meant a walk down Bridgewater Street to Manchester Road on which the school was located. 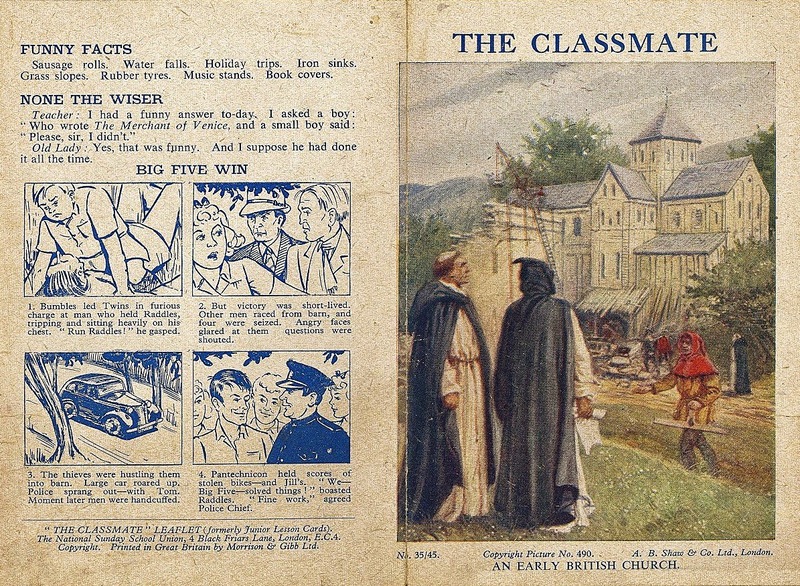 On the way, I would pass the Blair Sunday School on the left, which I attended regularly, mostly to collect the stamps of biblical scenes, which were handed out weekly, for inclusion in my booklet. 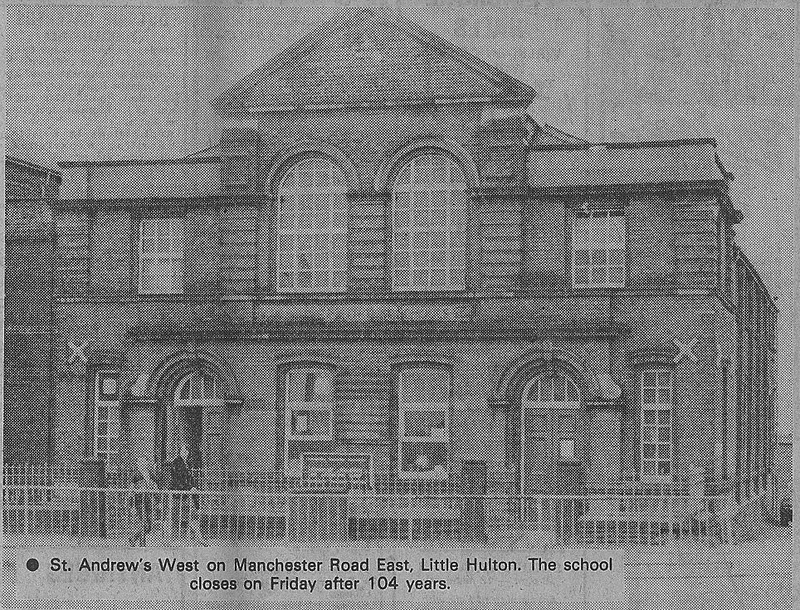 It was a Victorian brick building to which we walked each school day for our dinner, generally potato hash, with rice pudding for dessert. At school, we were give a small glass bottle of milk in the mornings, but not until we had answered our multiplication-tables question correctly! I remember with fondness making chains out of coloured paper to decorate our classroom at Christmas, and singing Christmas carols and eating whatever fare the local mothers kindly brought to our Christmas party. Remember, this was post-war austerity Britain, when receiving treats still meant something. 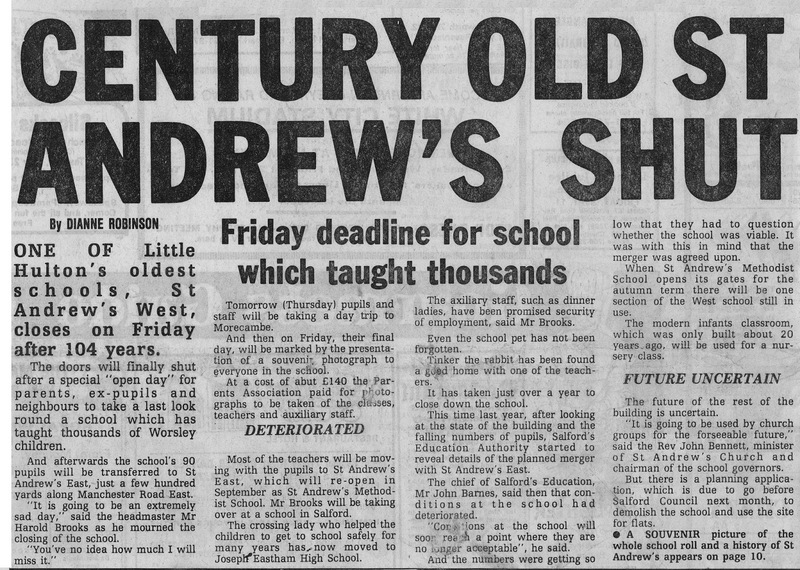 It appears that by the time the school was due for demolition it was known as St. Andrew's West, but I only knew it as Walkden Methodist School. 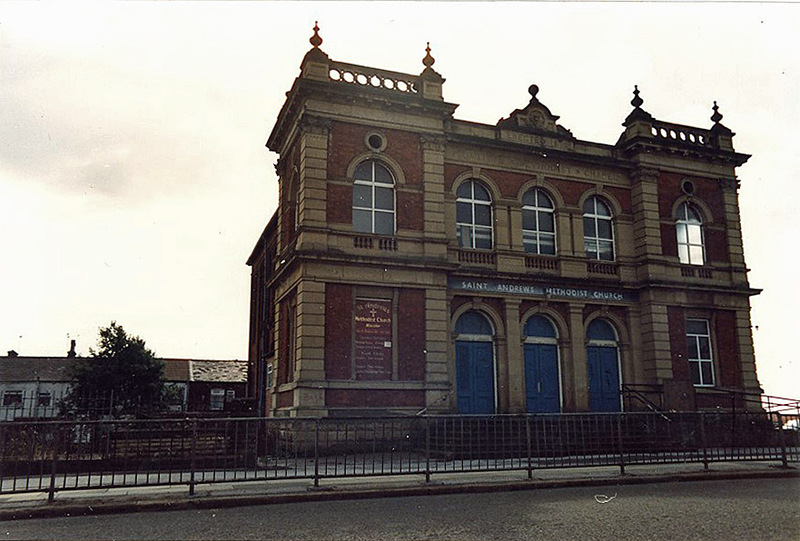 It was built around 1877, closed in 1981, and, sadly, eventually pulled down. 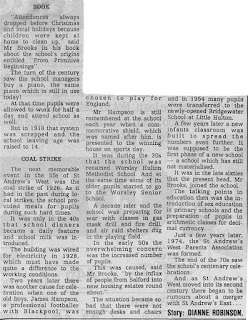 I went to this school in the 1970s. 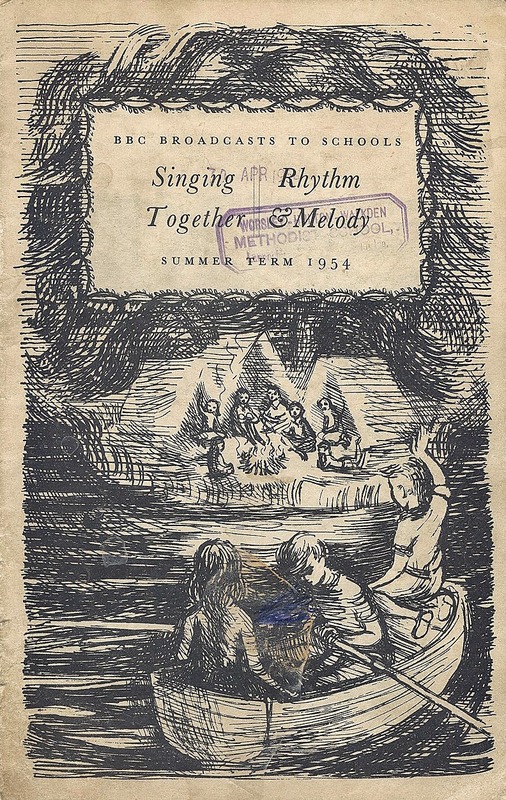 I have Mr Brooks's book in the attic celebrating its centenary. 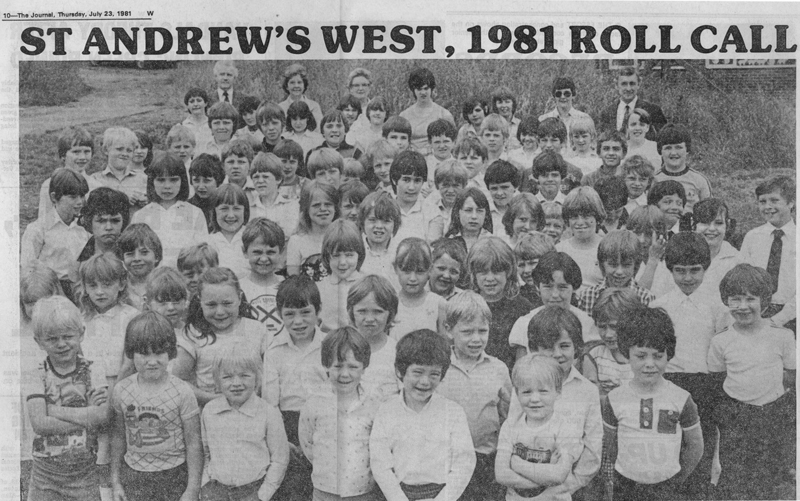 Will try to find it as it has photograph of the staff in it too. 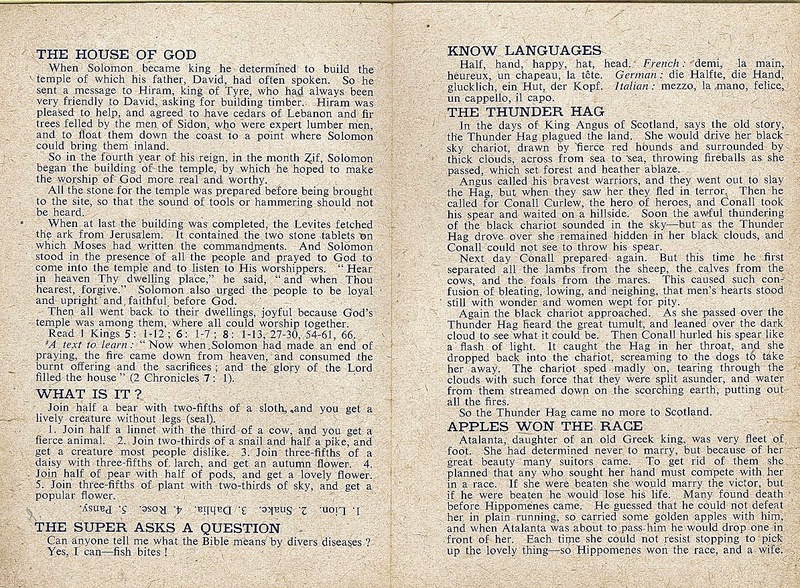 I used to have the book, but it went missing when I moved house many years ago. I was gutted because I'm mentioned in it because I was captain of the cricket team when we won the cup in 1974. I would love to know if there's anyway of getting another copy. I am sorry, I didn’t see your response! If I come across it I will let you know! It isn’t very large. I’m due an attic clear out soon! 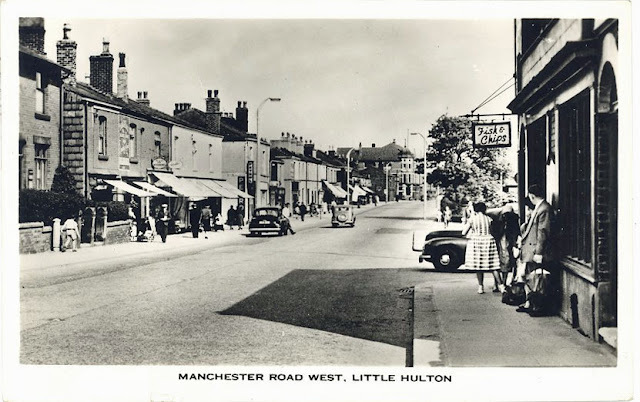 We moved from Pendleton to Trafford drive on what was the mount skip estate in 1953, I was 7 and my sister was 8, our younger brother joined us a couple of years later. As a family we used to attend the chapel next door. My Nan and my Dad had their funeral services there and my baby sister got married from there. My big sister and I both moved on to Hulton county.